Two centuries of service is a long time, and it should be celebrated. 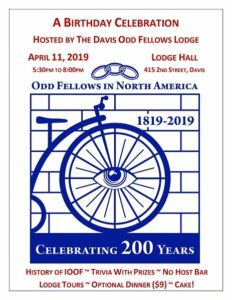 The Davis Odd Fellows Lodge will open the Lodge Hall to the community to recognize and celebrate the 200th anniversary of Odd Fellows coming to North America. The first Odd Fellows Lodge formed in April of 1819. So, Odd Fellows throughout the United States and Canada celebrate two centuries of existence and service in 2019. The Davis Lodge will host it’s anniversary party on Thursday, April 11, from 5:30 p.m. till 8 p.m. at the Lodge Hall, 415 Second Street, Downtown Davis. The community is invited. “On April 11, we cordially invite members of the community to stop by to visit the Lodge Hall, and help us recognize this 200 year milestone,” said Kevin Sitz, Noble Grand of the Davis Lodge. The Lodge Hall will be open to the public for the event. For those who wish to have dinner, there will be dinner available at 6:05 p.m. prepared by the Lodge chefs (dinner is $9 per person) , the Odd Fellows bar will be open, the big screen projection system will be running with slides of Odd Fellows events and projects, mini-tours will be available to view the Lodge Hall, a 10-minute lecture of the history of IOOF will be presented, and at 6:45 p.m. the Odd Fellows trivia master will challenge those in attendance with three quick rounds of trivia, with prizes for the winning tables. There is no charge to play trivia and all are invited. Currently, the Davis Lodge has 306 members with 13 applicants for membership. Odd Fellows is a fraternal order open to men and women, and is non-political, non-sectarian, and dedicated to good works in the community. The Davis Lodge is the largest Odd Fellows Lodge in California, and is distinguished with its 52 committees, all dedicated to good works in the community or planning social activities for the members. The members of the Davis Lodge are almost equally divided, men and women, and range in age from 16 to 92. Some of the more high profile events hosted by the Davis Odd Fellows include the Taste of Davis, Breakfast with Santa, the New Year’s Eve Party, Thursday Live! music at the Lodge, Odd Fellows Bingo, the Classic Film Festival, the Davis Chocolate Festival, Breakfast with the Bunny, the Picnic Day Pancake Breakfast, and many more. The Lodge has formed a new committee in 2019 to host a “Zombie Bike Ride” which will invite the community to set a Guinness World Record with the most people dressed as zombies on bicycles – an event for the entire community of all ages, planned for October (just in time for Halloween). The Lodge has a Community Support Committee which has provided funds and other support to a wide array of charitable and community organizations. In particular, the Lodge has supported foster children, as well as young adults who have aged out of the foster care system. In celebration of the 200-year anniversary of IOOF, the Lodge members have undertaken a “Walk Around the World” effort, counting their collective steps walking around the earth. It will take 65,740,092 steps to traverse the planet. Currently 35 members are working on this project, and the group has hit the 10 million step mark. Odd Fellowship is often called the three-links fraternity based on its symbol of three interlocking links, representing Friendship, Love and Truth – the bywords of the Order.